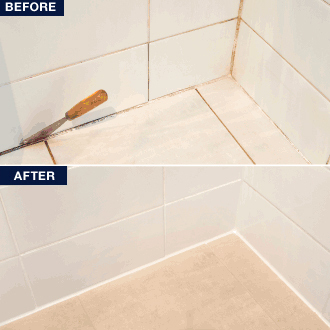 Apart from your shower looking brand new again, re-grouting will also add extended life as well. The new grout and silicone sealers will create a water tight shower cubicle again adding another ten to fifteen years onto the life of the re-grouted area. There are also health benefits to re-grouting. Not only will it get rid of nasty black mould which can cause severe respiratory problems, but the harsh chemicals you use to combat this mould will no longer be needed. The benefits of regrouting far outweigh the costs. Upon completion of your shower re-grout, Strictly Grout will provide you with a 500ml bottle of highly concentrated all natural ph neutral cleaner to use on your newly completed shower re-grout to keep it looking as good as the day we left.